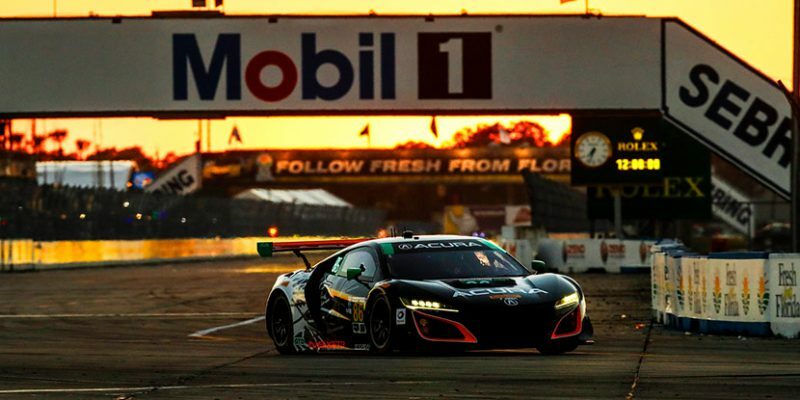 Mar 19, 2017 – SEBRING, Fla.
Acura Motorsports and Michael Shank Racing faced the toughest test in North American sports car racing – the Mobil 1 Twelve Hours of Sebring – and succeeded in bringing both of the team’s Acura NSX GT3’s to the finish in Saturday’s 65th running of the endurance classic. After 12 hours of incredibly hard racing around the bumpy, demanding 3.7-mile Sebring circuit, built on the grounds of a former World War II Air Force training base, the MSR Acura effort was led to the checkers by the #86 entry of Tom Dyer, Oswaldo “Ozz” Negri Jr. and Jeff Segal, who finished eighth in the GTD class after stretching the fuel mileage of their NSX GT3 to the maximum in the closing hours. The sister #93 NSX GT3 driven by Andy Lally, Katherine Legge and Mark Wilkins ran as high as second in the opening hour, and was fourth in class after four hours. But shortly after the five-hour mark, Legge was forced to bring the car to the pits with a suspension issue, ultimately requiring replacement of the left-front damper [shock absorber] and costing the team eight laps while repairs were completed. Back on track, the trio continued to lap competitively to the finish, but was unable to make up the earlier lost laps and finished 14th in GTD. Video recaps from this weekend’s Acura WeatherTech SportsCar Championship activities at Sebring are posted on the “Honda Racing/HPD” YouTube channel. Produced by the Carolinas Production Group, the video packages can be found in the 2017 HPD Trackside Video Playlist at: https://www.youtube.com/HondaRacingHPDTV. The 2017 WeatherTech SportsCar Championship resumes Saturday, April 8, with the Grand Prix of Long Beach in Southern California.